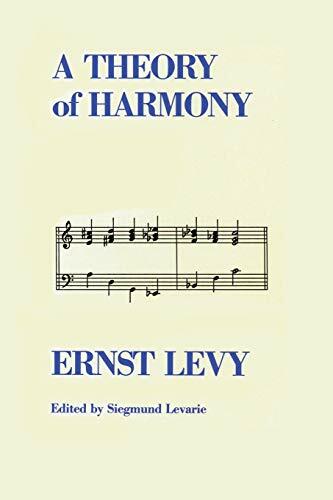 In this introduction to natural-base music theory, Ernst Levy presents the essentials of a comprehensive, consistent theory of harmony developed from tone structure. A Theory of Harmony is a highly original explanation of the harmonic language of the last few centuries, showing the way toward an understanding of diverse styles of music. Basic harmony texts exist, but none supply help to students seeking threads of logic in the field. 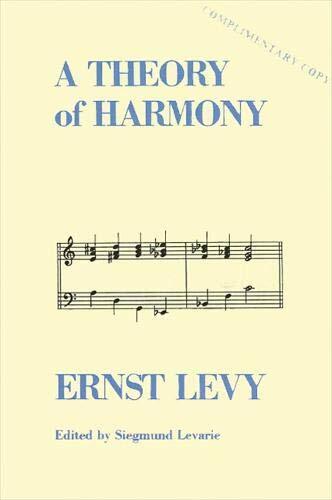 In a text abundantly illustrated with musical examples, Levy makes clear the few principles that illuminate the natural forces in harmony. He shows that general principles can be successfully extracted from the wealth of examples. This book actually provides a theory of harmony. One of the major musical minds of the twentieth century, Ernst Levy was born in Basel, Switzerland, in 1895. His musical career spanned more than seven decades, from his first public piano performance at age six. A naturalized U.S. citizen, he lived here from 1941 to 1966, teaching at the New England Conservatory, the University of Chicago, Bennington College, the Massachusetts institute of Technology, and Brooklyn College. After his retirement, Levy returned to Switzerland where he continued to compose until his death in 1981. He was an enormously productive composer, with hundreds of works to his credit including symphonies, string quartets, songs in English, French, and German, and music for solo instruments and small ensembles. His piano recordings, particularly of the last Beethoven sonatas and the Liszt sonata, have become collectors’ items. He thought of himself as a successor to Reimann, immediately, and Rameau, more remotely. Siegmund Levarie is Professor Emeritus of Music, City University of New York. He has published seven books on various aspects of music, and two of them were co-authored with Ernst Levy.